Ethan Knapp: The Bureaucratic Muse: Thomas Hoccleve and the Literature of Late Medieval England. For those of us working on fifteenth-century English poetry, Ethan Knapps articles on Thomas Hoccleve have been an inspiration. 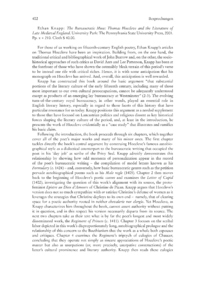 Building from, on the one hand, the traditional critical and bibliographical work of John Burrow and, on the other, the sociohistorical approaches of such critics as David Aers and Lee Patterson, Knapp has been at the forefront of those who have shown the ostensibly bleak terrain of this periods verse to be instead one rife with critical riches. Hence, it is with some anticipation that his monograph on Hoccleve has arrived. And, overall, this anticipation is well rewarded.